Mann's 'hockey stick' claims of the MWP and LIA being local were refuted years before it was published | Watts Up With That? 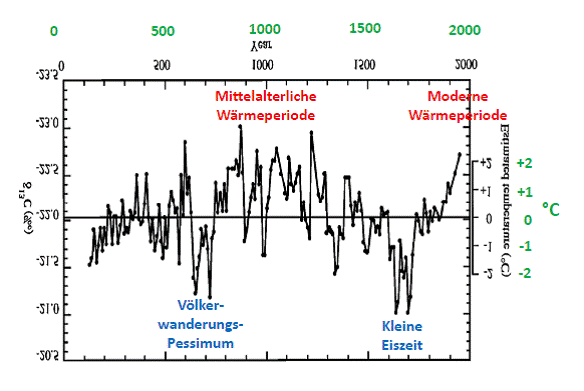 Geologist Dr. Sebastian Lüning and Prof. Fritz Vahrenholt found a Japanese tree-ring temperature reconstruction from 1995, one that should have been heeded by the IPCC and Michael Mann before they took the world on a 10-year joyride in the stolen car of “climate science”. Here’s the Google translation of their article, with some fixes of my own to help it along written in [brackets]. I don’t vouch for total accuracy in the translation, but it is the best I can do. Medieval Warm Period and the Little Ice Age as a local, North Atlantic phenomenon: Since when is Japan located in the North Atlantic? Leading representatives of the IPCC tried for years to have policymakers and citizens believe the pre-industrial temperature history was more or less uneventful and was the ideal climate ondition that we should all strive to maintain. The warming of the 20th century, on the other hand, was completely unusual, something dangerous. However, as we now know, the page turned a few years ago and the notorious Hockey Stick chapter ended. 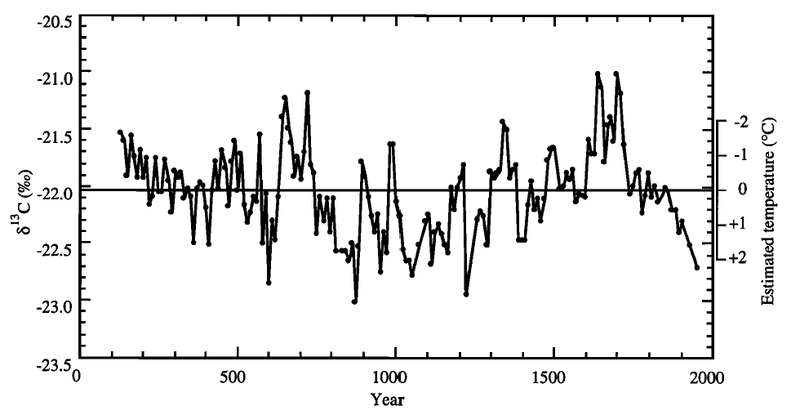 The flawed curve was taken off the market and the Medieval Warm Period and Little Ice Age reappeared. As is often the case in history, it is in retrospect difficult to comprehend how this historical joyride could have happened to begin with. It started at the end of the 1990s with a doctoral thesis by Michael Mann, and did not end until about 10 years later – thanks to the discovery of the scientific scandal by Steve McIntyre and Ross McKitrick (see the book The Hockey Stick Illusion by Andrew Montford). Today it is difficult to fathom how the main players and proponents of the Hockey Sticks are still able to act as experts and public opinion shapers. One of the main excuses used back then was that the Medieval Warm Period and Little Ice Age in Europe and North America were local phenomena. At other locations on the planet the temperature anomalies were more than evened out (e.g. Stefan Rahmstorf, Gerald Haug). For years we had to listen to their tales and we had to trust these “specialists” for better or for worse. Moreover, we paid them with our tax money so that they could deal exclusively with the climate and carry out the tedious work all this entails. However, anyone who knew a little something about the scientific literature soon began to wonder. The Medieval Warm Period and the Little Ice Age as a local North Atlantic phenomenon? A nutty claim. Naturally these characteristic temperature fluctuations had been described for other parts of the world. Here we report on a case study from Japan which had appeared in the Geophysical Research Letters already in 1995, in other words, in the years before the Hockey Stick episode. In the early 1990s, Japanese scientists Hiroyuki Kitagawa and Eiji Matsumoto extracted eleven tree ring cores from cedars on the South Pacific southern Japanese island of Yakushima. The cores contained tree-rings going back some 2000 years. The researchers determined the carbon 13 isotope values and found the delta-13-C values fluctuated in a characteristic manner (see Figure 1). Figure 1: Temperature reconstruction for the island of Yakushima in southern Japan on the basis of carbon-13 isotopes. Note: Temperature axis is mirrored: cold temperatures upwards, with warm temperatures down. Figure supplemented by Kitagawa & Matsumoto (1995) . What did these fluctuations mean? Carbon-13 amount is influenced by a number of factors, among them temperature. The Japanese scientists calibrated the isotope development on trees of different elevations (and thereby temperature level) above sea level. Using this method they were able to come up with a formula that could be used for computing the temperature value using the isotope change. The results showed that temperatures over the previous 2000 years in South Japan fluctuated over a range of 5°C. The course of the temperature fluctuations takes on a shape that is very well known to us (see Figure 2). A clear millennium cycle is depicted. The cold period of the Migration Period, the Medieval Warm Period, the Little Ice Age and the Modern Warm Period are clearly recognisable. Moreover, this climate development is well documented in Japanese historical records. Therefore, it is incomprehensible that with the clear Japanese data from the year 1995, the talk of a “local North Atlantic phenomenon” would go on for years after the data’s publication. Figure 2: The same curve as in Figure 1, but mirrored (up hot, cold at bottom) and marked with the historically known warm and cold periods. The two Japanese scientists even took it a step further. They carried out a detailed frequency analysis of their data and found characteristic cycles with periods in the range of several decades and centuries. Among others, they discovered a period of 187 years, which coincides with the known Suess/de Vries solar activity cycle. In a similar manner the 70 and 89-year Gleissberg-cycle was identified. In their results the authors saw a clear sign that the climate of the last 2000 years in southern Japan was predominantly influenced by solar activity fluctuations. The IPCC appears not to have been at all interested in the study. Indeed it did not fit with their climate catastrophe picture. I made a point of linking to this, as soon as I saw it at P. Gosselin’s page. Expect the usual drivel from stokes, connolley et al. They’re most lazyteenagers, after all. It’s a shame this is still “paywalled”. The desire for a global social, economic, and political transformation relied first on freezing, then on warming, and now on biodiversity. Whatever argument is plausible until thoroughly refuted. Plus now the schemers are hard charging on using education to change human nature to induce desired behavioral change. This New Economics Foundation is still transitioning but nef is certainly causing plenty of trouble in the UK. Plus no good will come out of Ford Foundation backing for this. They will have their social change whatever theory they have to use. Thank you for this. MWP is critical to a reasoned, non-alarmist approach to climate. Leaving it out, straightening the handle, is, in many ways, more important than finding a big 20th century blade. “Unprecedented” warming is the only thing which will provoke a policy response. Mann delivered and, sadly, we have wasted many billions of dollars on lame policy responses to what increasingly appears to be a non-problem. More studies like this one will, I hope, make the lunacy of carbon taxes and windmills more and more difficult to sell to an increasingly skeptical public. I was about to poo poo this as another tree ring study, but then I noticed they didn’t use tree ring width they used C13 to correlate to temperature. OK, suddenly the study has credibility in my eyes. But doesn’t this beg an additional question? Would this technique not be valid for other tree ring studies? Not that Mann or Briffa or Jones would actually make their cores available for study…. Ah so. those inscrutable Japanese have one up on Mann. Thanks Pierre, Anthony – great stuff. Elsewhere,the Law of Unintended Consequences: Gergis et al seem to have everyone producing hockey sticks from statistical thin air: Lucia is having fun over at the BlackBoard, and RomanM at Climate Audit. It seems a game for all the family. Sadly I lack enough stats to contribute, but following the arguments is good fun. Stamp ‘Rosebud’ on a hockey stick, and burn it. Without the hockey stick, of course, the whole AGW proposition, that we’re in a state of abnormal runaway warming, is a joke. Current temperatures are normal. The climate is fine. Anthony, Pierre Gosselin has a text version that I find both clearer, more legible, less ambiguous, and richer. Can you replace the one here with his? (c) search reveals the presence of solar cycles – Suess and Gleissberg cycles. So, the IPCC probably knew about this research, but chose to ignore it because it didn’t fit the preferred alarmist narrative. The dishonesty of the global-warming crowd is astonishing. We really should just start laughing at these people. I mean, sure, it’s good to trip back down memory lane from time to time, but we should use this for ridicule and scorn. Its always been an oddity that although the alarmists will tell us the MWP does not have enough evidenced to support the idea it was ‘world wide’. There more than happy for a far more restricted range of evidenced, indeed down to ‘one tree’ at times , to be more than enough to support the claim of climate doom. As with such much of climate science that cannot meet their own low standard , but then its ‘different ‘ when they fail , like a good politician is a strong belief in do what I say not do what I do . STOP THE PRESSES! STOP THE PRESSES! Hockey Stick proves we will all die. Buried somewhere between ads for tinea and the death notices. Hockey stick wrong! why is this site listed as lukewarmer here? Its obviously 100% warmist. I think that by giving it a lukewarming status you are assigning it a respect it does not deserve. Please consider putting it in the same category as RC or like. This isn’t the only evidence re Japan; the Emperor’s gardener kept careful records of the cherry blossom’s blooming day — going back for a millennium. They also confirm the MWP. d13C doesn’t necessarily have the same problems as TR width, so this may be a useful new class of proxies. I could go up into the Cascades or the Blue Mountains, core a dozen or so trees, some near water, and some up on the hill just yonder, some spaced apart, and some crowded together, some on the East slope and some on the West slope of that draw, and prove any kind of temperature graph you want me to prove. The true stories of tree cores are best left to private foresters, who know quite well how to read them. These are folks climate scientists have no knowledge of. They grow trees for profit. That is if they are any good at it. If they aren’t, the President of the University will not be coming round to bail them out of the mess they will find themselves in. Bearing in mind that we pour scorn on Manns tree rings as being an unreliable proxy for temperature for a myriad of reasons (limited growing season, susceptibility to local micro climates etc) we shouldn’t rush in to praise this study just because it tells us what we want to hear. IF the methodology of using C13 to correlate to temperature is considered so accurate, as others say above, why don’t we apply it to other tree ring studies-such as Manns? Sorry, tree rings might be just about acceptable at dating or demonstrating moisture levels in the summer, but a global thermometer accurate to fractions of a degree? I don’t think so. You’re right; hard to wrap your mind around something that profound. One of the important reasons they had to do away with the idea of a global MWP is the “tipping point” concept, The concept that we are near some magic global temperature that will tip us into positive feedback and disaster. If the earth has previously exceeded the “tipping point” temperature without going into positive feedback much of the scary argument is weakened. tonyb, very well-stated cautions. The point of the article, though, was that there existed a study that looks to be at least as robust as Mann’s (arguably more robust since there doesn’t appear to me to have a decline requiring hiding) that was pointedly excluded from consideration by the IPCC and their warmist supporters. Mann did not just take some tree ring width data and interpreted it; he ran it through an algorithm of his own making to get the result he wanted. And then he invented Mike’s Nature Trick To Hide The Decline to get rid of that “divergence problem”. There’s so much wrong with what he did that it would be an extraordinary claim that any other proxy study is only half as wrong. “why is this site listed as lukewarmer here? It’s a remnant of the days when Joe Bastardi was there. Yes, it should be recategorized now. Check your spam filter. Pierre sent you permission. The size of the ring or amount of C13, neither can tell you climate or temperature….only the length of that periods growing season….. Thanks very much for this Anthony and thanks to Pierre. Even I can understand this info and graph. BTW have a look at these two charts of SLR showing all the models from Antarctica and Greenland, i.e. 99% of the planet’s ice. This is out to the year 2300. Greenland ( 10%) is positive for the next 300 years but Antarctica is negative. ( 89%) So where is all this dangerous SLR going to come from I wonder? But why isn’t info like this used to counter the likes of alarmists Gore and Hansen, Flannery etc. The subtitle of the article is Since when is Japan located in the North Atlantic? Well, in the days of Apartheid the South African regime ensured that visiting Japanese people were treated as honorary whites. It would have been bad for business to do anything else. Similarly, for the purpose of saving the planet, the Japanese islands can be treated as North Atlantic islands. After all, we have got to get rid of the medieval warm period, haven’t we? Well, the MWP was obviously still a strictly local phenomenon. Just local to the North Atlantic, Antarctica, and Japan. Maybe Australia, and Russia. Also the Middle East, Africa. Possibly North and South America. And some oceans. It’s local to Earth. Just local! They didn’t measure tree rings? If so then this is an outrage! Carbon-13 I tells ya!!! Now onto some past related events. The MWP was a global phenomenon. M. Mann’s Hockey Stick is a figment of his delusional imagination. I think it’s reasonably well known that Sebastian Lüning & Fritz Vahrenholt have recently written a book which at present is available in German. I believe it reached number 1 (22,000 sold) on Amazon’s listing of books about ecology and the environment. It is called ‘Die kalte Sonne: Warum die Klimakatastrophe nicht stattfindet’ or ‘The Forgotten Sun: Why the Climate Catastrophe is not taking place’. Hopefully it will become available in English. This is one of the interviews given by Fritz Vahrenholt about the book and his views on climate change together with another article which is a debate between Rob van Dorland and Bart Verheggen v Sebastian Lüning & Fritz Vahrenholt. Fritz Vahrenholt is an interesting and dialectical figure in Germany: The book has been criticized in German newspapers and a lecture he was due to give at the University of Osnabrück was cancelled because the subject of the book was considered too controversial. I was confused by the statement that the Hockey stick chapter ended. I was under the impression that the IPCC and the “team” still believed in it. All this unprecedented wamth rubbish leaves me cold. I was just thinking the same thing? Come on Mann let’s give it a shot. Briffa? Heh, heh. I am afraid it goes beyond that with nutty claims. Yes, the MWP and the LIA as a local phenomenon is a nutty claim, but at the same time the MWP and the LIA as a global phenomenon is a nutty claim, too. The same goes for the present “global warming”: a nutty claim. But maybe we have a global cooling instead? No, it would be a nutty claim. What about “neither cooling, nor warming” then? Sorry, a nutty claim again. Why? Because the data available is not sufficient to draw any conclusion of the kind. tonyb, need I remind you we are in guerrilla warfare. Let Warmists find fault with C13 and post it here. Let them show how tree rings are a better proxy than C13. We are in a David V Goliath situation and David cannot afford to be Mr. Fair Guy. Warmists can afford to be Mr. Fair guy yet they are certainly not but they are still losing. Interesting curve! I’d be inclined to guess that the fast wiggles before the Völkerwanderungspessimum were an abnormal period requiring a catastrophic explanation, and everything after that is a return to a nice periodic pattern that doesn’t need any special handwaving. Can’t have that, of course; the modern period has to be the abnormal catastrophic tipping-point, because only the modern period contains nasty sinful Western civilization. Incidentally, Pessimum is a wonderful word. It’s the logical counterpart of Optimum, but for some reason it never formed in English. Thank you Pierre Gosselin, for bringing this to our attention and translating it. Are there any papers analyzing the data from the Emperor’s gardens? Comparing various national versions of Wikipedia pages is a source of endless fun; even though the pages are linked, their authors seem to be unaware of each other’s efforts. I’m just not sure that d13C has been well established as a T proxy. I was able to find some evidence that it served as a proxy for RH in a species of tamarisk in North Africa. Unless Rubisco has been shown to have a preference for d13C at either higher or lower temperatures I can’t see this relationship as holding. The proportion of d13C in the atmosphere has no relation to T except for the changes which are attributable to burning of fossil fuels, so the action of Rubisco would be the mechanism. Anyone have any refs which might proved or disprove this point? I found one which might explain something but can’t read it until I am on campus tomorrow. Do you think this is a helpful way to advance the discussion? Thank you Pierre and Dr. Sebastian Lüning and Prof. Fritz Vahrenholt and Anthony. One sometimes wonder with all this CAGW drivel in the MSM, could i be wrong? After reading history for most of my life all of a sudden the MWP and the LIA disappears? Could all those starving Europeans during the LIA have been faking it? And it appeared in the Geophysical Research Letters in 1995? And the GRL never noticed? Where are the editors? Replaced by the Team? But thank you so much. Faith in the fairness and honesty of scientists is slowly being restored. No need to stoop to their level, in fact doing so causes more harm than good because the warmists influence the MSM heavily, and any misstep by skeptics gets magnified as a result. That said, I cannot completely agree with tonyb. He is absolutely correct that C13 cannot possibly measure temperatures during the non growing seasons. That said, for the growing season, the only influence on C13 (based on my reading on the matter anyway) is temperature. If the warmists insist on using trees as thermometers, it makes more sense to be critical of their methodology on both counts. First regarding the growing season and second that tree ring thickness is influenced by disease, pestilance, precipitation, cloud cover, foraging animals, late frosts and many other factors. If we pursue a methodology that ACTUALLY measures temperatures that trees were exposed to during their growing season, and it confirms the tree ring growth, so be it. But I’d give rather long odds that it won’t. I’m sure I’ll corrected if I’ve got this wrong. Mann and “The Team” are the only ones who appear to be publicly defending it. IPCC no longer does … but they keep acting like it’s true. They’ve just found other equally “vaild” one-study-wonders to justify the actions they’ve always wanted to take. Did you know that several (Japanese) cedars in Yakushima are more than 3,000 years old? I’m not qualified to say that C13 correlates to temperature or not. It sounds like what they did using C13 from indivual rings of many trees agrees with other data and historical records that show MWP and LIA. I think the “biggie” here is that there was a study using tree rings like Mann’s did (though he seems to have relied on just one tree ring) that didn’t show a hockey stick and, since it didn’t show humans had done something that needed to be taxed and controlled, was ignored by the IPCC. I added that link to my list of all-time favorites in my guide to WUWT at http://home.comcast.net/~ewerme/wuwt/index.html , I ‘ll tack this one on too. I think it’s much more important to link those two together than linking to Michael Mann. Looking at the time axis, the reconstruction seems to end around 1950. Since about half the warming that makes up the blade of Mann’s hockey stick occurred since then, this would seem to account for some of the discrepancy. (The first graph above includes the recent instrumental record). This reconstruction being local rather than northern-hemispheric would also account for some more of the discrepancy, as others have noted. It is to be expected that it would have higher variance than a global reconstruction. Anyone knows the exact year this reconstruction ends? A bit like flogging a dead horse, except that that statement literally applies to a useless object. The basis for alarmist AGW theory is scientifically unjustifiable, it remains alive and true. However, although the blogging supporters continue to believe it and persist in vocal defence, just as we persist in vocally advocating the injustice, the governments adopting “counter” warming schemes have already made their beds in which they can lie together with the IPCC and its masters. The point of contention here is the existance of the MWP, which this graph clearly shows, in opposition to Mann. The discrepancy in question has nothing to do with post 1950 temps. In my opinion, Mann’s tree-ring reconstructions were never meant to find the MWP or LIA. They were meant to confirm the current warming, and proclaim it “unprecedented”. All of the tree rings were put through a process that found those that correlated well with just the temp record. They never looked for those that found TWO items (temp record and MWP). If the entire series were re-run looking for the MWP or LIA, they’d probably find several trees that matched. But they’d lose the hockey stick in the process. Entirely off topic but here in the US it’s “Father’s Day”, so, Happy Father’s Day to all those to whom it may apply, whether you carry a hockey stick or not. This is not a global study. Trying to apply C13 stuff to something like Mann’s might work, but there would have to be a clear methodology to link the C13 data from the different regions sampled. They’re good at splicing temperature to tree ring data, so I’m sure they could do it. Given research that shows the MWP and LIA were global events, regional studies that don’t need to splice different sources have a place in the discussion. As with any scientific paper, the rsults should be reproduced and other proxies that do record sub-freezing periods should be examined if there are decent ones. The WMP extends from roughly AD 800 to AD 1400. Mann’s reconstruction featured above only extends back to 1000AD. It has very wide error bars back then. The temperature anomaly during the last part of the MWP is quite consistent with mid-twentieth century temperatures, albeit significantly below current temperatures. It is difficult to make any genuine comparison with Kitagawa and Matsumoto. The spread in temperatures is about 4C, compared with Mann’s 1C. The anomaly during the MWP seems to be around +1C on average but we don’t know what the baseline calibration of the proxies were (What is the 0C anomaly relative to?). The last point in the graph features an anomaly or +2C around 1950. This would be much warmer than the MWP average! But it is merely local and this last temperature is not statistically significant anyway owing to the large variance. I am not faulting Kitagawa and Matsumoto; only some of the inferences made here. Someone who can access the paper would usefully inform us of the the baseline of the temperature anomaly and the end date of the reconstruction. People should not praise this proxy simply because they like the answer. Do any of the readers whose praise is so fulsome know anything about the reliability of C13 as a temperature proxy? Didn’t think so. In addition, contrary to the assertions of the authors, this series has been used as a component in a number of multiproxy studies. It’s in the Yang et al 2002 China composite, which in turn is used in numerous multiproxy studies. I recall it being used in other studies, though I don’t recall which off hand. The MWP-modern comparison is an interesting question, but no conclusions or moral should be drawn from this series. Thanks Steve McIntyre. I see that there is a post on Climate Audit about Yang et al 2003 that features this proxy. And Yang et al 2003 is used in Mann and Jones 2003 among other places. My only question is this: how many studies regardless of the source have to tell the same story about the LIA and MWP before we start to accept it as fact and that either these multiple studies somehow coincidently all came to this same result somewhat magically, or do we accept that perhaps somehow these are simple validation on each other? I don’t think we should ever jump to conclusions based on ONE study, but at some point when you have study after study showing the same thing and that only faulty statistics as performed by Mann et al show the other side, you have to ask yourself whether we trust the results from bad statistical modeling or the multitude of studies that showed the same thing. Now some may say that this is the same argument as Mann et al who said that countless other studies using the same faulty statistics justified and otherwise validates his methodology…however that is not the same thing. We are talking about different methods coming to the same conclusions. Doubtless, we can never say for certain what the past was like in the LIA and/or MWP as although multiple studies show the existance of both, they all seem to differ on the actual highs and lows and the in-betweens….but we can say for certain that any study that does not show them perhaps missed something somewhere. Its always been an oddity that although the alarmists will tell us the MWP does not have enough evidenced to support the idea it was ‘world wide’. There more than happy for a far more restricted range of evidenced, indeed down to ‘one tree’ at times , to be more than enough to support the claim of climate doom. That’s when they arn’t trying to flat out deny the MWP (along with the RWP and LIA). I suspect they use a simple metric. If it supports their claims it’s “global”, if it dosn’t then it’s “local”. Indeed, this is the difference between using an established proxy and pseudo-proxies determined after the fact to be “proxies”. Unfortunately, it doesn’t support the idea that MWP temperatures were any warmer than at present. I would remind people that I do believe in the MWP and LIa and indeed have written on them. However, tree rings have many faults as a thermometer not the least being that trees have a short growing season and are suspectible to their local climate. In pointing to this grave shortcoming in Manns work we should also be sceptical of other tree rings studies purporting to pick up an a temperature signal of considerable accuracy. Apparently even Fritz Vahrenholt was not entirely certain of the results in his paper. He stated in an interview with European Energy Review that for many years he believed in the IPCC reports and even used a Hockey Stick graph in his presentations. He realised that the IPCC had misguided people about the Medieval Warm Period after reading Andrew Montford’s book, The Hockey Stick Illusion, and learning about the difficulties encountered by Steve Mcintyre. In 2010 he was asked to review a report by the IPCC into renewable energy. He found many errors and noted that much of the summary had been written by Greenpeace who concluded that by 2050, 80% of our energy could be produced by renewables. He found this unscientific and started to reconsider the IPCC’s Assessments. He discovered that the IPCC was essentially a political organisation and that one third of the core writers of the 2007 Summary for Policymakers were connected to Greenpeace and the WWF. He wondered what people would think if the core writers had been from Exxon or Shell. “Would that be acceptable?” he asks. He further states that climate models cannot simulate the Pacific decadal Oscillation or the Atlantic Multidecadal Oscillation and that these oscillations are moving into a cooling phase in tandem with the sun moving to a less active phase. As a result he predicts cooling until 2035 or even 2050. As Steve, TonyB, and others have said, there is an issue. How can it be decided in a reasonable way, whether any measure is a good proxy? I learned a lot when I compared the notorious Yamal treering proxy records to a lot of reasonably proximate thermometer records. It was clear that pretty well all the thermometer records moved in step over both short periods and long periods of time – whereas this did not happen with the treering records. To me, this discovery meant that I felt I could trust each of those thermometer records – because they jived with each other in many small and large details. In this study, the oxygen isotope record has been shown to jive with several different factors, in a similar way. Solar cycles and elsewhere-recorded evidence for MWP and LIA. To me, these factors mutually reinforce each other. This might seem like the rightly-failed technique of screening for fit between 1850 and 1900 – failed because it cannot help but produce hockey sticks. But it is not the same. It is requiring fits on several counts, much more like a key individually cut. Sure, in the end it could all be coincidence. But we can consider statistical probabilities on that too. And I think the Japanese study wins on these counts. The above article has gained (from the count on my page elsewhere) over a hundred more viewers. Not much compared to this site, I know, but How many do you suppose will see it on stoke’s page? The issue with tree rings is not the dating of the ring but to what extent one can extract a temperature profile/signal from the growth ring. In my opinion all tree ring studies fail because of the difficulty of extracting a true and representative temperature signal from the ring. Since Japan is a narrow island nation growing conditions are likely to be heavily influenced by conditions of the surrounding oceans, and one may therefore expect to see some correlation with ocean cycles. It cracks me up everytime the LIA is called “regional to the north atlantic”… When you go visit the glaciers in New Zealand’s south island, there are signs showing how far the glacier has retreated since the LIA… indeed, it was there that I learned about the LIA. Otter, I wasn’t talking about the linking, but the insults. What really is notable is that isotope studies on wood really do not seem to be popular with the team at all. AGW climatology seems to be one of the few fields where tree-ring isotopes are are not used regularly. Isotope profiles from White Mountain Bristlecone pines were employed to calibrate C-14 profiles to yield better C-14 dates, since the rings give an absolute date. In fact those studies revealed the underestimate of the original half-life figure for C-14 as well. It should also be possible to obtain ratios of the hydrogen isotopes as well. In short wood should contain sever proxies that would provide a check on how well ring thickness correlates to temperature without even resorting to calibrating to thermometers. With absolutely no attribution to the claim, it didn’t last long and was modified twice over the next 24 hours until it –as of now– reads as a more reasonable statement. Well, isn’t that a news flash. It’s colder because it isn’t warmer! No wonder Wikipedia has zero credibility on anything remotely related to weather, climate or temperatures. Well, Smokey, I don’t unequivocally support everything that appears on Wikipedia pages, in _any_ controversial area. The entries _always_ reflect the intellectual biases of the editors, despite editorial policy to present unbiased information. The editorial guidelines state that every key point in any article is supposed to have a published reference link to support it. In this case, there was no reference given to support the added “global warming” statement. So that nonsense _did_ get tossed out fairly quickly –before I even had a chance to get to it. SilverBear… gosh I seem to remember seeing when you first came to Wikipedia… faint memory bells ringing. The problem with WP attributions is that they give more credit to a sensationalist and uncomprehending newspaper account than to the original researcher’s work direct. It’s a serious systemic fault of NOR which works well for most of WP but creates cr*p in controversial areas.